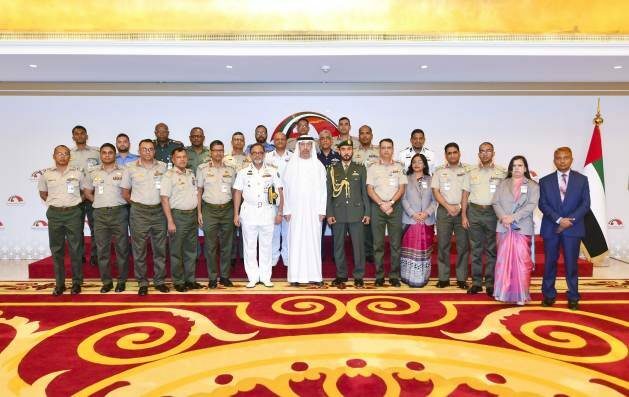 ABU DHABI, Sep 14 2018 - Ways of accelerating cooperation and partnership relations, exchanging of experiences, information and knowledge were the main topic of discussions at a meeting Ahmed Shabib Al Dhaheri, Secretary-General of the Federal National Council, FNC, had with a delegation of the National Defence College of Bangladesh. The two sides met at the FNC’s premises and discussed ways of boosting ties for the benefit of the two peoples and reviewed issues of mutual concern. The delegation was briefed on the activities of the council, its roles, as well as its legislative and supervisory and parliamentary achievements. The delegation also reaffirmed the importance of strengthening parliamentary relations between the FNC and the Bangladesh Parliament at all levels. The delegation expressed their pleasure for visiting the UAE, and lauded the UAE’s remarkable progress in various sectors and achieving many accomplishments at local, regional and international levels. At the end of the meeting, the delegation toured the council’s building.